Strawberry Lemonade Bars | Do You Even Paleo? 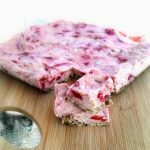 Strawberry Lemonade Bars | Do You Even Paleo? IF using gelatin, add water to the lemon juice. VERY SLOWLY sprinkle gelatin into lemon/water mixture, stirring as you go. You’re trying to avoid the gelatin from clumping, so don’t just dump it in. Then, allow mixture to set for 4-5 minutes (omit this step if you opt to not use gelatin). Remove crust from fridge and pour filling over top. Return to the fridge for at least 30 minutes. Then they’re ready to eat! However, I think they’re best if left overnight. If you have coconut milk on hand, you can use that instead. Just refrigerate the can overnight and use the cream that rises to the top!